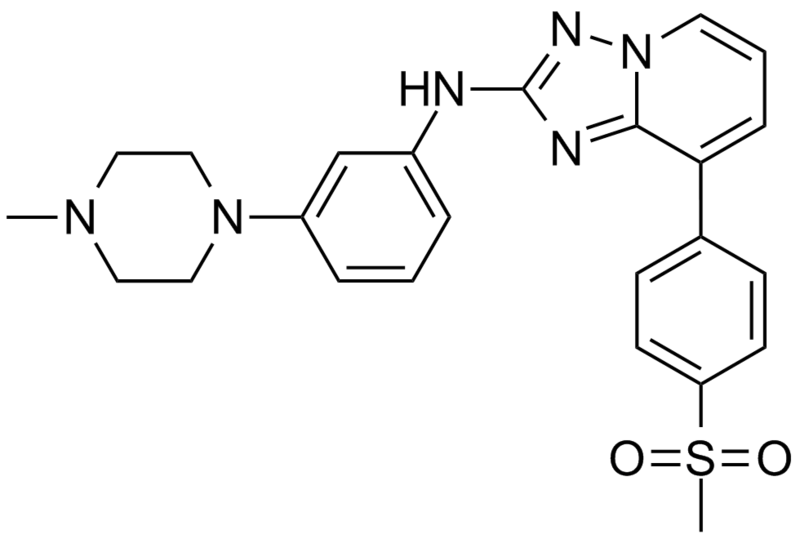 Description CEP-33779 is a selective inhibitor of JAK2 with IC50 value of 1.8 nM. CEP-33779, is a highly selective, orally active inhibitor of Janus kinase 2 (JAK2). When evaluate against the other members of the JAK family, CEP-33779 demonstrates varying degrees of selectivity from >40-fold versus JAK1 to >800-fold against TYK2. In a cellular system, CEP-33779 is shown to inhibit JAK2 in irf-bla TF-1 cells utilizing the GeneBLAzer reporter assay. It is also able to mitigate several immune parameters associated with SLE advancement, including the protection and treatment of mice with lupus nephritis. 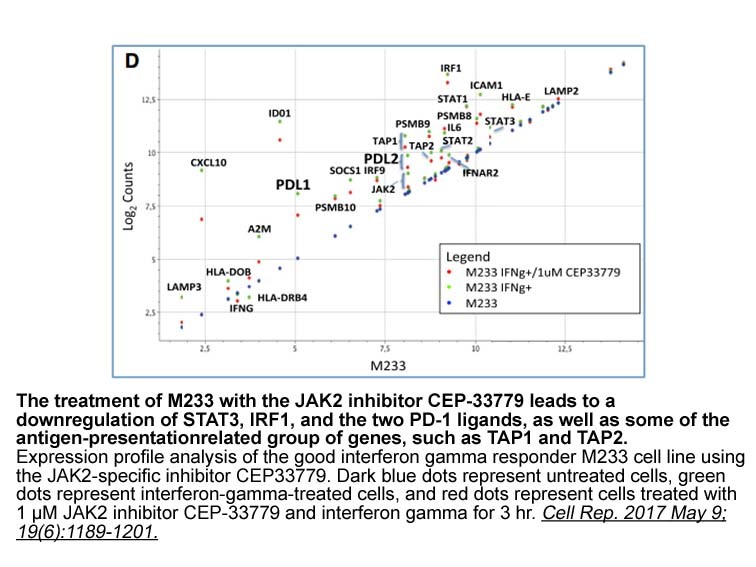 The ability of CEP-33779 to suppress growth of colorectal tumors by inhibiting the IL-6/JAK2/STAT3 signaling suggests a potential therapeutic utility of JAK2 inhibitors in multiple tumors types, particularly those with a strong inflammatory component. Kristine L Stump, Lily D Lu, Pawel Dobrzanski, Cynthia Serdikoff, Diane E Gingrich, Ben J Dugan, Thelma S Angeles, Mark S Albom, Mark A Ator, Bruce D Dorsey, Bruce A Ruggeri, Matthew M Seavey. A highly selective, orally active inhibitor of Janus kinase 2, CEP-33779, ablates disease in two mouse models of rheumatoid arthritis. Arthritis Research & Therapy 2011, 13:R68. Lily D. Lu, Kristine L. Stump, Nate H. Wallace, Pawel Dobrzanski, Cynthia Serdikoff, Diane E. Gingrich, Benjamin J. Dugan, Thelma S. Angeles, Mark S. Albom, Jennifer L. Mason, Mark A. Ator, Bruce D. Dorsey, Bruce A. Ruggeri, Matthew M. Seavey. Depletion of Autoreactive Plasma Cells and Treatment of Lupus Nephritis in Mice Using CEP-33779, a Novel, Orally Active, Selective Inhibitor of JAK2. The Journal of Immunology October 1, 2011 vol. 187 no. 7 3840-3853. Matthew M. Seavey, Lily D. Lu, Kristine L. Stump, Nate H. Wallace, William Hockeimer, Teresa M. O'Kane, Bruce A. Ruggeri, Pawel Dobrzanski. Therapeutic Efficacy of CEP-33779, a Novel Selective JAK2 Inhibitor, in a Mouse Model of Colitis-Induced Colorectal Cancer. Mol Cancer Ther April 2012 11; 984.